The WWDMAGIC show is the staple in the fashion industry for retailers, buyers and brands and the reason we are so proud to say that Miso Pup was a part of it. This was our first year exhibiting and definitely not our last. Every February and August the retail industry convenes, in Las Vegas at WWDMAGIC, to spot and shop the latest trends in men’s, women’s, juniors’ and children’s apparel, footwear and accessories. WWDMAGIC is the global showcase for contemporary luxury brands and for 3 full days- the largest and most influential buyers from around the world come to the Las Vegas Convention Center and The Mandalay Resort and Casino to set the newest trends, shop the most-wanted brands and in collaboration with Women’s Wear Daily (WWD) is the must-see buying destination that fuels the business of fashion. First of all, we would like to Thank everyone who stopped by our booth and we are beyond thrill that the fashion industry and retailers are welcoming products for pet parents and Miso Pup with open arms and wagging tails. Today, more than ever, our small dogs are part of our family and are treated as our furever furbabies. We travel and tote them wherever we go and the retailers are realizing that PupSize Pet Parents want fashionable & functional products that allow them to incorporate them into their lives. I can’t explain how happy we are, that retailers, buyers and the style influencers share our vision and are willing to offer PupSize Pet Parents functional and fashionable products that make sense for their lifestyle, in their stores. The Miso Pup Interchangeable Pet Carrier is not just an airline approved pet carrier with mix and match “shell” totes. The Miso Pup Interchangeable Pet Carrier was designed to give the modern day small dog owner the ability to change the look and style of their pet carrying bag, while providing small dogs with a comfortable and safe way to travel and be toted in their very own familiar bag. So many small dogs experience high levels of anxiety, nerviness and stress whenever their moms and dads pull out their “airline approved” carrier. And typically pet moms and dad’s only use their “airline approved” pet carrier when they absolutely have to, because until now, most of the “airline approved” bags are not suitable, stylish or functional enough for their everyday lifestyle. 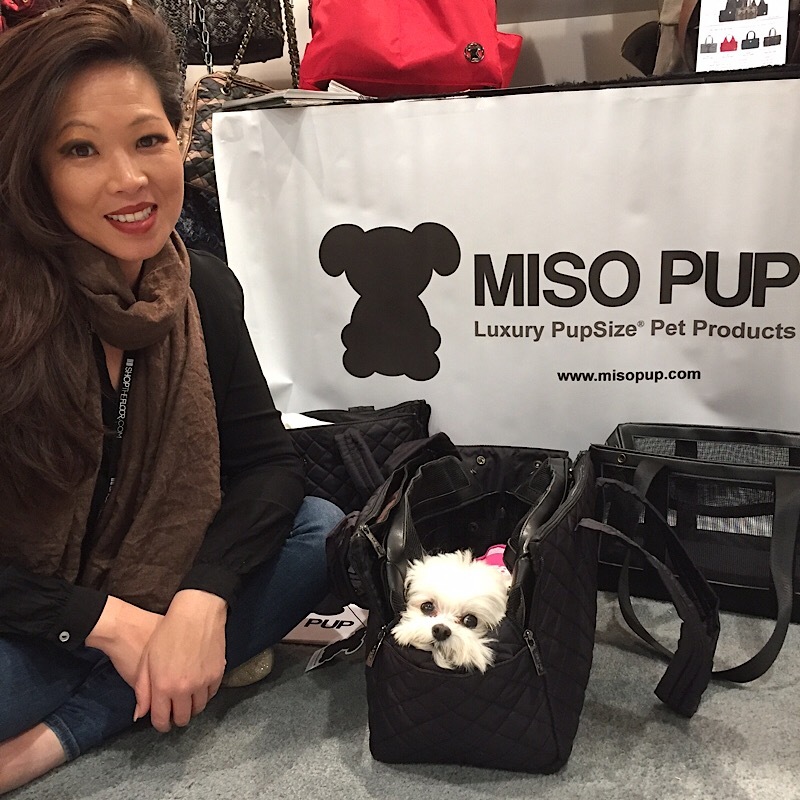 After speaking with the hundreds of visitors in our booth at WWDMAGIC, it became very apparent that the fashion world is ready and excited for a brand like Miso Pup, to be considered as an fashion accessory and not a pet product. Not surprising, many of the retailers, buyers and store owners have a PupSize dog and if they didn’t, almost every single person named someone they know that does. It’s not surprising considering that there are over 54 million dogs in the U.S, with over 50% of those dogs being small dogs. Exhibiting as a new vendor at any trade show can be exhausting and thrilling at the same time. I’ve exhibited at shows before, but not as Miso Pup and not with Little Miss Abigail Grace. This was my 4.5 pound Maltipoo’s first experience as a full fledged working spokes model and she did great. We can’t wait until our next show and for pet parents to be introduced to Miso Pup in retail stores, until then you can learn more about Miso Pup’s Interchangeable Pet Carrier here.